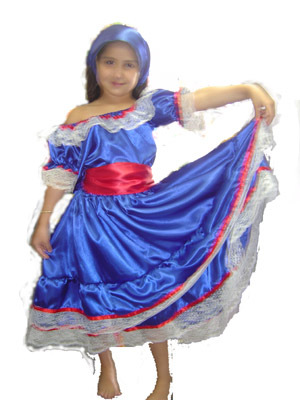 TRADITIONAL CULTURAL COSTUME CONSISTS OF BLUE SKIRT WITH RED RIBBON TRIM AND LACE DETAIL. INCLUDES OFF SHOULDER BLOUSE WITH RIBBON AND LACE TRIM. ALSO AVAILABLE IN RED. 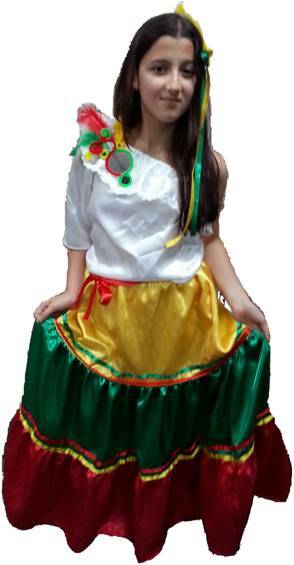 NOTE THAT COSTUME SIZE IS TRUE TO TYPICAL CHILD'S AGE. 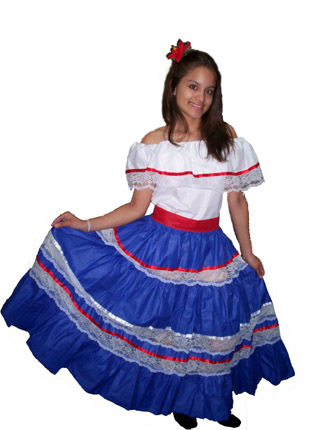 REGIONAL OUTFIT FOR DANCE AND SPECIAL EVENTS CONSISTS OF OFF SHOULDER BLOUSE AND SKIRT WITH LACE AND RIBBON TRIM. 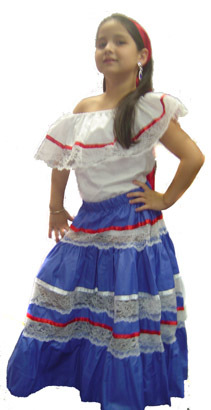 REGIONAL OUTFIT FOR DANCE AND SPECIAL EVENTS CONSISTS OF OFF SHOULDER BLOUSE AND BLUE SKIRT WITH LACE AND RIBBON TRIM. 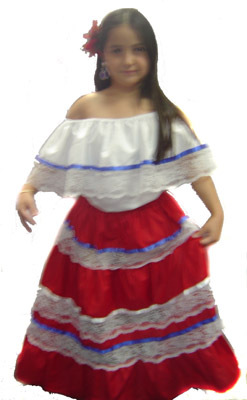 INCLUDES COORDINATING RED WAIST SASH.